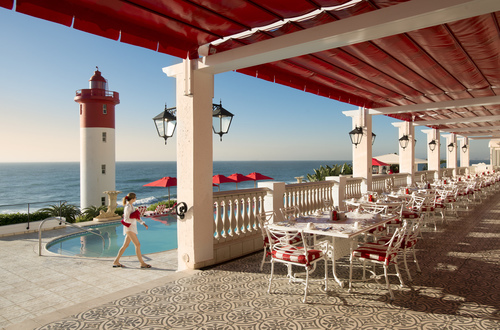 The Oyster Box is one of KwaZulu-Natal’s most distinguished hotels, set majestically on Umhlanga’s prestigious beachfront. 80 Individually inspired rooms and suites are a luxurious blend of colonial charm and modern convenience. A top scorer for leisure, The Oyster Box has superb restaurants and cocktail bars, and a unique spa designed to soothe mind, body and soul. There are five state-of-the-art conference rooms for executive and celebratory events. There's currently no specials at Oyster Box. crystal Venetian chandeliers, and views of the lighthouse and Indian Ocean. This luxurious venue is perfect for dinners, large events and conferences. create a larger area for up to 200 people. Colonial, warm and intimate, and displaying a fascinating pictorial history of the renowned Durban July horseracing event. Ideal for meetings, workshops, cocktail functions and presentations. A gazebo-covered patio provides the perfect breakaway. Filled with memorabilia of the Union Castle cruise-liner, this venue is ideal for meetings, launches and presentations, or as a private dining venue. This venue is suitable for small conferences or private dining.